February 27, 2015 By heather 1 Comment This post may contain affiliate links. Read my disclosure policy. 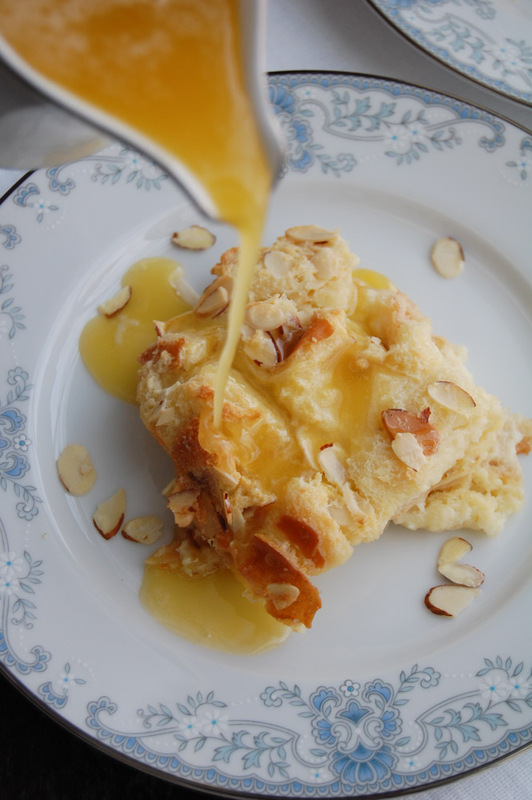 Amaretto bread pudding is a classic dessert. Warm bread pudding topped with an amazing amaretto sauce. Special enough for celebrations and easy enough for every day. This bread pudding recipe has been with my family for as long as I can remember. The Amaretto gives it a nice little kick and a little fancy but almond extract can be used instead. Cut or tear your bread into 1/2 inch pieces and place in a bowl. Pour the half-and-half over the bread and let it soak up for an hour. The sauce is where it’s at! You could pour it on anything and it would make it taste good. Cut or tear bread into 1/2 inch pieces. Place into a large bowl and cover with half-and-half. Let mixture stand for 1 hour in the refrigerator. In a small mixing bowl, beat the eggs, sugar and almond extract. When the bread is ready, stir in egg mixture into the bread mixture. Gently fold in the almonds. Grease a 9x13 baking dish with the 2 tablespoons of butter. Pour mixture into the baking dish and bake for 1 hour or until top is golden. Stir the butter and sugar together over low heat until sugar is dissolved. Remove from heat, briskly whisk in the egg and Amaretto. Pour sauce over bread pudding and serve.